One of the things I really like about my spinsterhood is not ever feeling self conscious about doing whatever I want to do whenever I want to do it. Living in New York, there's a lot of pressure to do cool and exciting things all the time, but sometimes (re: most of the time), if I'm honest, I just want to do nothing. Or better yet, I want to do something I could have done living in the suburbs. I miss that, you know? Unfortunately, I couldn't sleep any later, so I just went with it. After a bowl of Honey Bunches of Oats with Strawberries (the best cereal in the world, clearly), I took a shower and hung out in my turquoise chenille bathrobe with giant white polka dots and a towel on my head. It's very old lady and unattractive, and of course I love it. Step 2: I did some things I've been meaning to do. So, last summer I just had to have a bike. I rode with some new friends all the way out to Gerritsen Beach and bought one out of some random man's basement bike shop. Well, I rode it for about two months, and then it stayed in font of my apartment building, collecting rainwater and dirt in the dips of its increasingly-papery bicycle cover. My super was paying way too much attention to it, so I decided it was time for me to let it go. I gathered some old clothes, including a sweet square-toed pair of boots I've had since eighth grade, and took all of it to the Salvation Army a few blocks away from my apartment. The only thing was, it wasn't even open yet, so I had to leave the bag of clothes by the door, and I gave the bike to an old man who was smoking a cigarette as he peered into the windows of the gated store. Weird. I live in Queens. It seemed the most appropriate neighborhood when I was moving out of Manhattan. And I love it. I love that I'm a few stops away from Bloomingdales on 59th Street in one direction and a few away from Target and Queens Center mall in the other. I'm sure I don't have to tell you that I frequent the Target, well, much more frequently. Yesterday, though, I was visiting Queens Center Mall with my friend Janine. 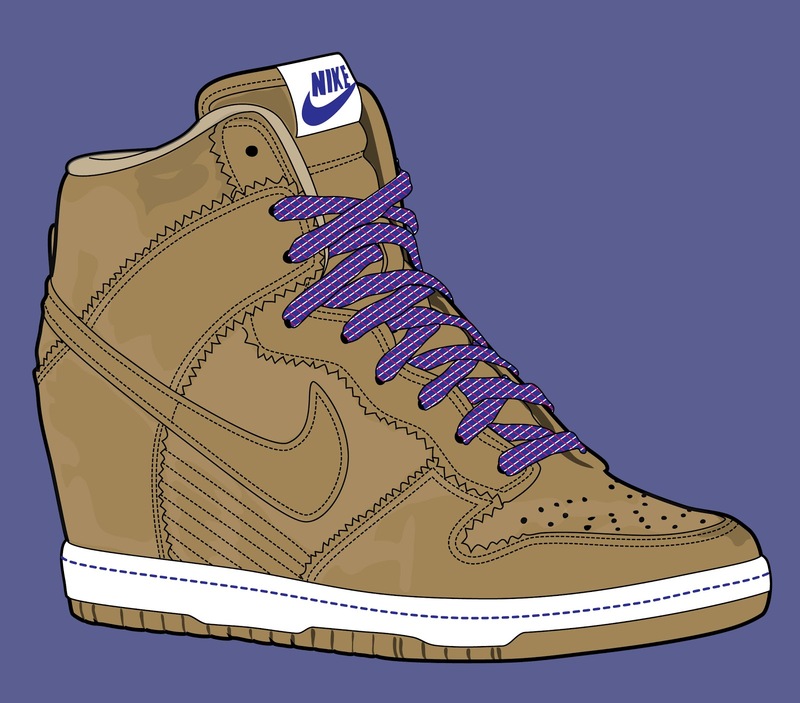 I needed a pair of Nike Dunk Sky Hi's. Bad. But of course I was really early. Most of the stores weren't even open yet, and I relished the idea of sitting at a table at the Starbucks Kiosk drinking a caramel frappuccino and writing an extra-long entry in my journal. So that's what I did. And it was awesome. Queens Center Mall is a good place for a spinster to hang. There are, like, a million jewelry stores where you can browse fine jewelry (more on this in a later post), a Sephora in the JC Penney, and a pretty good makeup department in the Macy's. One of my favorite things to do in my spinsterhood is letting the ladies at just about any makeup counter give me what they call a "touch up," but usually turns out to be a full-face makeover. I'm into it. So Janine and I did that. Oh, and also, they have chair massages there, and of course I've done that, too. Nobody knows me in Elmhurst, Queens, so what do I care? And we also ate in the food court. Somehow this has never stopped being an exciting prospect for me. The mall where I grew up didn't actually have a legitimate food court, so they still inspire in me a sense of wonder at all the choices in one place. As such, you can imagine the overwhelming feeling I get sometimes just walking down the street in New York. So I relish the idea that I can heat bourbon chicken off of a toothpick every time I visit the mall. Overall, it was a successful trip to the mall. In my last semester of school, I lived only a few blocks away from the movie theater at 8th avenue and 34th street. It was during this time that I realized what a real joy going to the movies by myself can be. I can decide I'm going to the movies five minutes before I go; I can go early in the morning, if I want; no one will ask me questions or talk to me during the movie; I don't have to have that awkward moment where I try to be accommodating about seating arrangements when neither of us actually cares; I don't have to worry about whether or not they're enjoying themselves or trying to hold my hand. All in all it's a good situation for me. One time i even got the mini corn dogs but was really embarrassed when I realized I was going to have to sit out in the open while we (the audience) waited for the theater to open, therefore silently admitting to everyone that I was really planning to eat those nuggets of nasty (/delicious). So I did that. I went to see Here Comes the Boom. And it was silly and seemingly shot in only a few days, but I liked it. And I'm not ashamed. And while I watched it, I ate the bag of mini kit-kat bars I bought at the Rite Aide before I went. And it was great. Step 5: In for the night. As I walked home after the movie around 7pm, i knew I wouldn't be going back out once I got home. And as I took off my pants while walking to the sofa, I knew I would be ordering a pizza online and watching old episodes of Frasier on Netflix. And so I did. And it was great. I think i went to sleep at 9pm, and I woke up at 5:30 am this morning. I'm pretty sure I'll take a nap later. And you know what? I can do that. Because wallowing in my lameness is one of my favorite things to do.